China CITIC Bank International Limited ("CNCBI") is 75%-owned by CITIC International Financial Holdings Limited ("CIFH"), which in turn is a wholly-owned subsidiary of China CITIC Bank Corporation Limited ("CNCB"). The remaining 25% of CNCBI are owned by Tian Yuan Trading Limited, Hong Kong Guansheng Investment Co., Limited, Anxin Trust Co., Limited, Clear Option Limited and Elegant Prime Limited. By providing value-creating financial solutions to define and exceed both wealth management and international business objectives of Greater China and overseas customers, CNCBI aspires to be "the best overseas integrated financial services institution", with the highest international standards and capabilities. CNCBI’s footprint in Greater China includes 30 branches in Hong Kong, as well as branches and presence in Beijing, Shanghai, Shenzhen and Macau. CNCBI also has overseas branches in New York, Los Angeles and Singapore. We are committed to manage your wealth with utmost professionalism and care, working just as hard to preserve and grow your assets as you have to earn them. Our Chinese roots are reflected in an investment philosophy that values stability as the foundation of success. Our goal is to create an enduring partnership that helps you prosper while enjoying peace of mind. As you accumulate wealth, changing circumstances and new opportunities can all affect your investment objectives and make financial planning complex. Establishing a long-term relationship with a bank you trust is essential. After formulating an approach tailored to your objectives, your relationship manager will closely monitor your portfolio and provide regular reviews. We offer finely orchestrated financial solutions based on a diversified yield-enhancement approach, together with a wide range of tools and solutions. Drawing on proven wealth management tools, your relationship manager will create customised solutions to help protect and enhance your wealth. Investment involves risks. The prices of investment products may go up as well as down and may become valueless. It is likely that losses will be incurred rather than profits made as a result of purchasing investment products. Investors should refer to the relevant offering document and risk disclosure statements and consider their own risk appetite, investment objectives & experience, financial resources and other relevant circumstances before making any investment decision. If needed, investors should seek independent professional advice. This document does not itself constitute an offer of, or an invitation by or on behalf of the Bank to any person to purchase or acquire or invest in any investment products. Enjoy exclusive access to our Private Banking Centre in Lippo Centre, Admiralty. Reserved solely for Private Banking patrons, The Centre offers the ultimate in comfort and privacy. * Please visit www.plaza-network.com for further information. Services and facilities may differ at various locations. Services and benefits offered by the lounge are subject to and bound by the term and conditions of Plaza Premium Lounge, and may be altered at any time without prior notice. Complimentary meet and greet service with limousine service (for Hong Kong only) is capped at 2 times per year and maximum 4 persons per time. Pre-bookings must be made by phone at (852) 2280 1880 (Private Banking Card Customer Service Hotline). 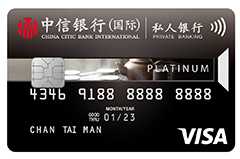 China CITIC Bank International Limited (the "Bank") reserves the right to alter, suspend, or terminate the above promotional offers and its related terms and conditions at any time without prior notice. In case of dispute, the Bank's decision shall be final and binding. You are entitled to a 0.8% cash rebate!# All retail transactions at any merchant and cash advances qualify for Cash Rebate Rewards. Calculated monthly, these will be automatically credited to your Credit Card account. Call your relationship manager to learn more.